Don’t let common air conditioning problems leave you sweating it out. Our technicians can quickly diagnose and address your AC repair issues and return your home to comfort in no time. Not only does your air conditioner cool your home and provide relief from the heat, it helps maintain indoor air quality by filtering out allergens and contaminants. If it suddenly stops cooling, let the professionals at Huntinghouse HVAC take care of your air conditioner. Determining the type of air conditioners your home needs, how many units to purchase, and their location on your property are all important decisions. Let the professionals at Huntinghouse HVAC walk you through the process. An important part of preventive maintenance is hiring a contractor with the right skills and experience for the job. Huntinghouse HVAC has over 20 years of experience in the Pensacola and surrounding areas with superior HVAC maintenance services. If your AC or furnace is aging or suffering frequent breakdowns, the professionals at Huntinghouse HVAC can help you determine if repair or replacement is your best option financially, as well as the function and dependability you can expect from each option. Huntinghouse HVAC serves home owners in the Pensacola, Pensacola Beach, Gulf Breeze, Milton, Pace, Perdido Key, Navarre, Destin and Ft. Walton and surrounding areas in FL. We have used Scott Huntinghouse Air conditioning Service for many years for both my business and home. 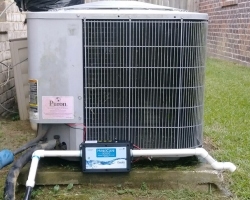 They have replaced and moved systems and were always economical, explained the problem and solution and were concerned that my customers not be inconvenienced in any way. Always on time, solve the problem, treated well and I love the staff. Great guys all around. The reason to use the local business, they become friends and neighbors, I always recommend them. Great!! Scott's team was very professional and on time. They left the work area clean and haven't had a problem with the system again. Highly recommend Scott Huntinghouse Heating and A/C! !